Chocolate’s creamy, soft texture not only enhances our love affair with our favorite desserts, it triggers memories of nibbling on bunny ears, gelt, Reese’s chocolate pumpkin or Valentine’s hearts. A whopping 92 percent of women and 87 percent of men regularly eat chocolate, or at least admit to it, and there’s good reason for it! Chocolate contains a chemical called phenethylamine — a chemical our bodies produce when we’re attracted to someone. Chocolate also contains tryptophan, a raw material for serotonin, which can cause the feelings of ecstasy and elation and is usually produced when we are in love. Ever wonder why when people start to fall for someone else they’re inclined to bring a box of chocolates? Or, when a dreaded breakup occurs the first thing you do is self-medicate with the biggest bar of chocolate you can find? Since your brain is no longer producing those love chemicals, it tells you to find them in other areas . . . and chocolate is ready to oblige. But beyond love, dark chocolate has other health benefits including flavanols, which act as powerful, healthy antioxidants. However, the sugar content in most chocolates counter-balances the benefits. For the last several years, even decades, our love of chocolate has revolved around sugar filled varieties like Hershey’s, Russel Stover, Godiva or anything with caramel and sugary centers. Recently, as consumers become more health conscious about their luxurious love affair with chocolate, their sophisticated palates are looking for a change – sugar free. If you’re a health-oriented chocoholic, or just someone looking to make healthy choices— desperate for a loveable sugar free chocolate without all the typical side effects— look for bars sweetened and enhanced with the benefits of stevia – Like SkinnyMe Chocolates. 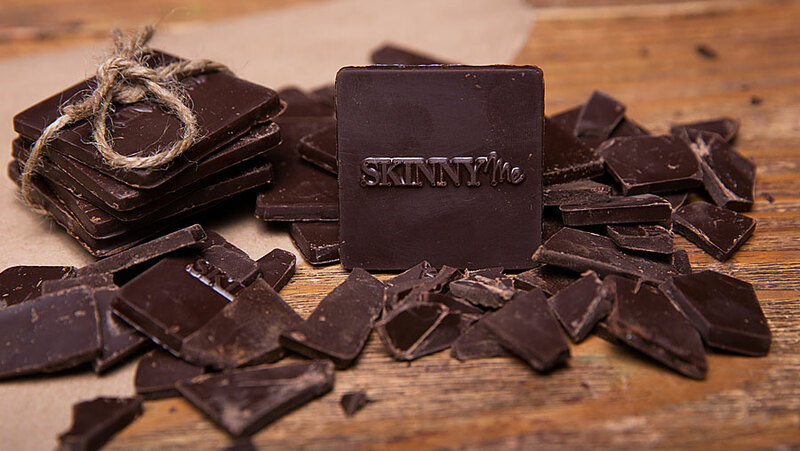 Click here to view the delicious sugar free flavors and taste what all the chaos is about at SkinnyMe Chocolate.